Our topic is 'Walk like an Egyptian'. We will be learning about what life was like for Ancient Egyptians, their gods, their art and clothing as well as their jobs. We will be linking the Egyptians to every aspect of our learning, including our wake and shake!. Please see our class newsletter for more detailed information. 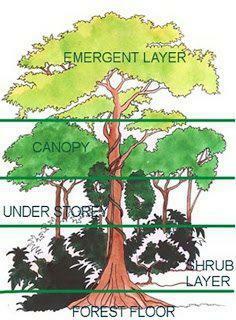 Our new topic is 'Under the Canopy'. 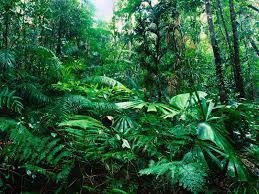 We will be learning about the locations of rainforests around the world and what their climate is like. We will be linking rainforests to every aspect of our learning. Please see our class newsletter for more detailed information. Our class assembly is in the school hall on Wednesday 2nd March at 2.30pm. Afterwards we would love for parents to join us in the classroom to see our fantastic work during our Egyptian project. We do hope that you can make it. This term our topic is all about The Egyptians. We've already learnt lots so far about famous Pharaohs and gruesome mummification!There's lots more learning about this ancient civilization to come yet! Here we are using weights and also measuring things around the classroom. We have been looking at converting centimetres into metres, grams into kilograms and milli-litres into litres. Ask your child if they can remember the amounts! This our new class display all about presentation. We are focusing on making our books and writing look amazing by remembering punctuation, starting at the margin, reading through to make sure our writing makes sense, keeping our letters on the line, etc. When the children complete a really good piece of work, they are awarded with a new piece of their pencil on the display - when they complete the pencil they will win a pop up pencil to use in school. The children are trying so hard - we are really proud of them. 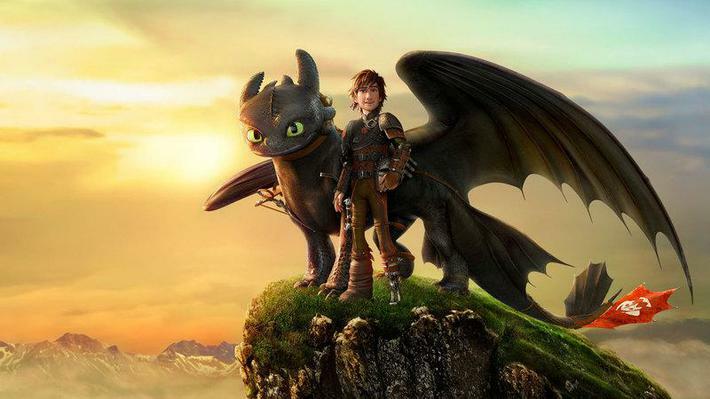 This half term our topic is called How to Train Your Dragon and will be based on the famous book and film. Lots of fun guaranteed! We wrote some fantastic stories based on Shaun Tan's The Lost Thing. We made our stories into books and read them to our Year R reading buddies who loved them! We learnt all about 'The Grain Train' - how the bread gets from thew seed to the loaf of bread we eat. We made our own mini loaves to take to church for the Harvest Festival service. We have to tell you that an incident happened on the night of 14th September, 2015. A ROCKET crashed into Year FDour and Aliens invaded the classroom!!!!!! Chair were overturned, plants hacked for samples, drawers searched, laser holes appeared and there seemed to be rather a large amount of mysterious green slime and space dust scattered around the classroom. 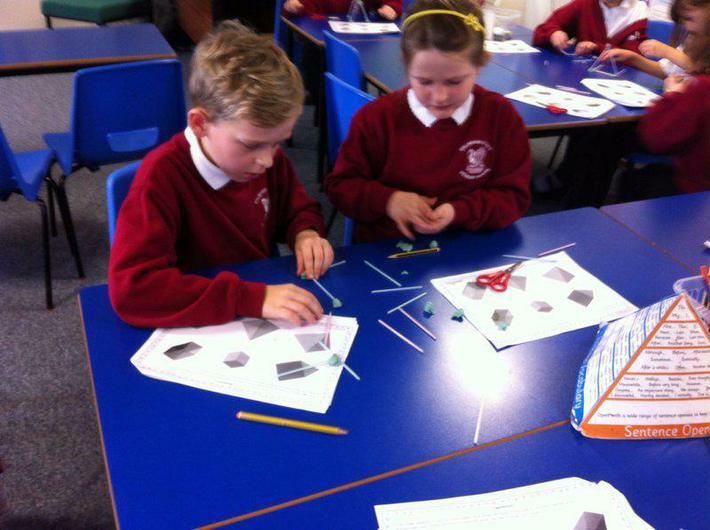 Our pupils became 'Alientologists' and carried out an investigation. 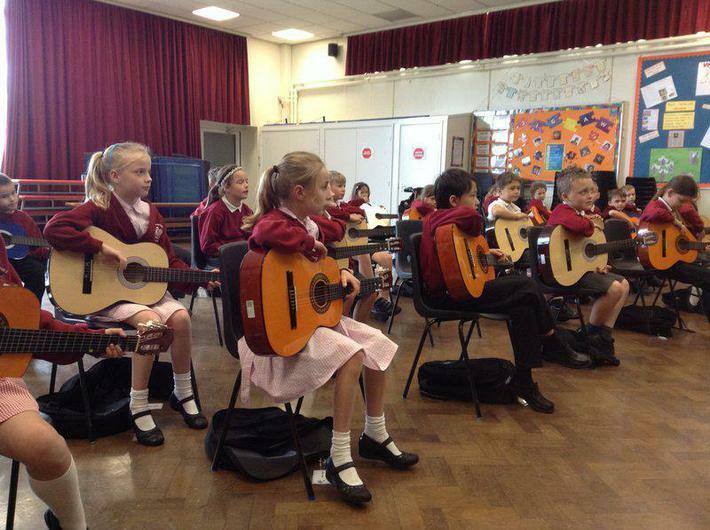 Our Guitar lessons are brilliant! We will be having an assembly on the 7th July at 11.20 to share our music with you. We have been making 3d shapes using straws and blobs of playdoh. Have a look at our photos in the children's work section. 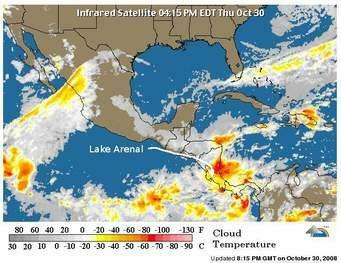 Our autumn 2 topic is Crazy weather. We will explore different climates and weather conditions. We will make instruments to record the weather and forecast our results to each other using digital media. At this stage, pupils should develop their ability to solve a range of problems, including with simple fractions and decimal place value. Children should be able to use measuring instruments with accuracy and make connections between measure and number. Well done squirrels, we have been changing fractions into decimals this week. You were brilliant. Challenge: Impress your families with 1/4, 1/2 and 3/4 as decimals!! Our class assembly is fast approaching. At 9:10 on the 22nd October, Squirrels class will be sharing their learning about the Rainforest with you. Please come along and watch them perform and then stay for a coffee afterwards. Squirrels have started the new year off well, we have already learnt so much about our topic and they are all very enthusiastic to learn more. We are looking at Rousseau in Art and his interpretation of the Rainforest theme, in geography we have plotted the Rainforest's on a world Map and in computing we have looked at Wikipedia to see how the rainforest is reported, before we make our own wiki page. We are being very brave and will be putting on our class assembly first! It will be the 22nd October at 9:10. We hope to see lots of you there! More details to follow in due course. We were lucky enough to be invited to watch a production of The Witches at Sherborne Girls School. Everybody enjoyed it, especially the white chocolate mice at the end! We all enjoyed a great day out at the Mash-Up Music Festival at Bovington. The sun shone down as we watched bands on stage, danced and sang along. We also had street dance, beat-box and theatre show workshops. Some of us even managed and ice-cream! Take a look at the wonderful art work year 4 have produced. They were inspired by the artist Andy Goldsworthy, who uses natural materials to create stunning works of art. We spent an enjoyable (if very muddy and wet!) morning planting in the environmental area. The plants were especially chosen to attract certain butterflies. We had a visit from 'Munching Caterpillars' and learnt lots about butterflies and moths. Did you know butterflies have taste buds on their feet? Reception Class had a visit from the Police today and we were invited to join them to see the police car. Some of us were very excited! We had great fun today (26.02.14) investigating different materials to see if they were solid or liquid. We also had to guess what the material was and there were some funny answers. We thought handcream was yoghurt! and some funny faces smelling the vinegar! This week's homework is to look out for solids and liquids at home. Year 4 are being very enthusiastic about our work on Ancient Egypt. We hope you saw the superb mummies with their own sarcophagus on parents' evening. We have also learnt about hieroglyphics and written our names on scrolls. 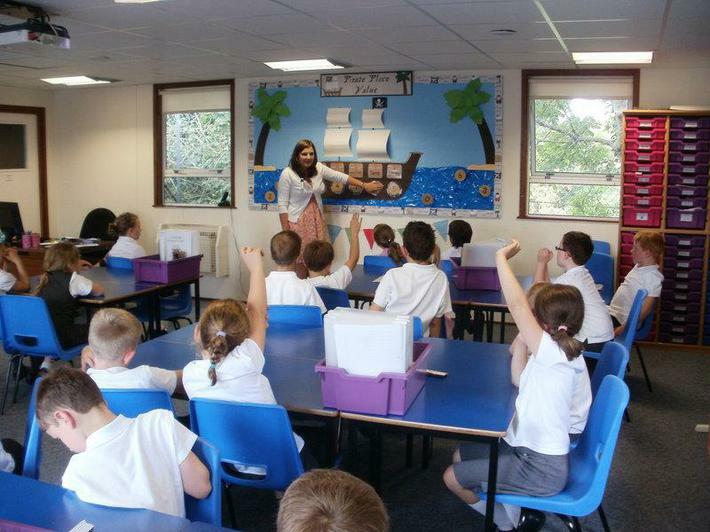 In literacy we have learnt some perfomance poetry about exploring in Egypt. Here are a few photographs of our work. As part of our Jigsaw PSHE work, the whole school made objects for a garden of Hopes & Dreams. Year 4 made fantastic mobiles - here are just a small selection. We sold them as part of the Jigsaw Assesmbly and made over £160 for charity. Well done to everybody! We have been learning all about skeletons and the human body in our science lessons this term. We drew around Elijah and filled in all the bones and parts of the body that the childen knew - we were vry impressed with thir knowledge! There are also some photos of the children making their own animal skeletons out of plasticine. Thanks to Caitlin and her family for bringin in some fishy skeletons! 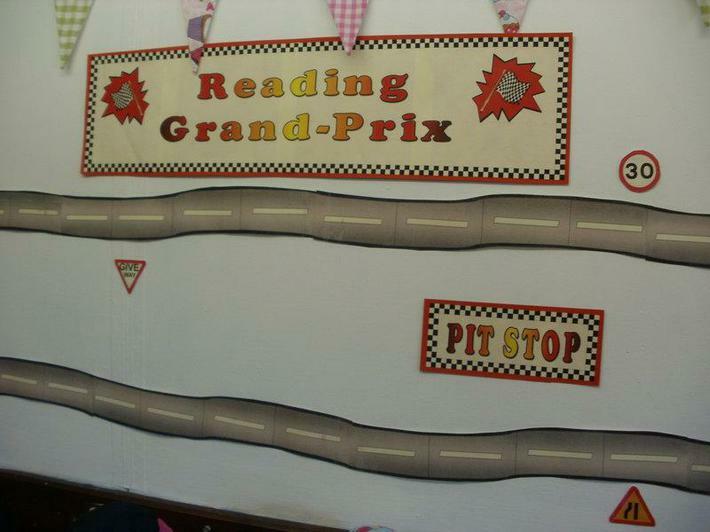 Check out our super cool Grand-Prix racing track in our cloakroom area. 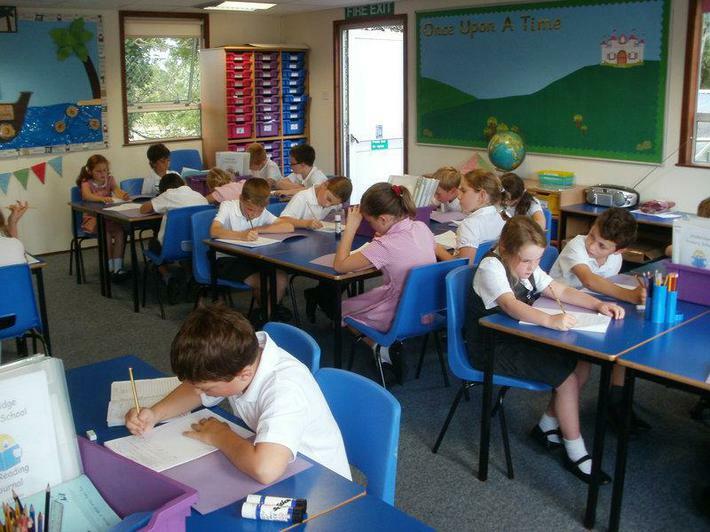 Each class member has their own Formula One racing car and can move it along every time they have an adult sign their reading journal to say they have read at home. At the end of term we will anounce the winners and award a trophy! Everyone is very excited and eager to move along as quickly as possible - Many thanks to all parents for your continued support with reading at home. Mr Penfold comes in every Thursday afternoon and teaches us how to play brass instruments. Some of us play the trombone, some of us play the trumpet and some even play the cornet! We love it and make a great noise (although Miss Gould doesn't always agree on that one!). Click on the picture to see more. We worked really hard in our first Literacy lesson. 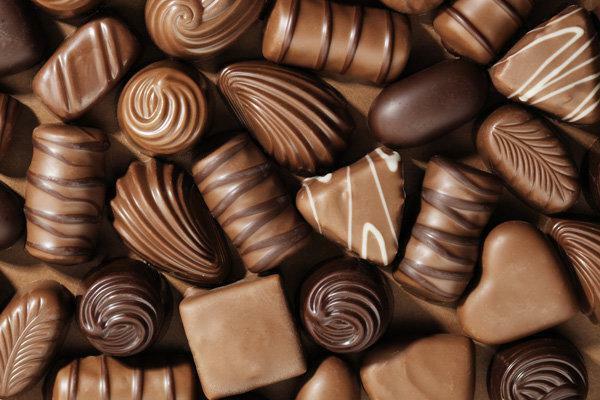 We wrote a recount of our best day in the holidays. What a fantastic time we had and did some amazing things! 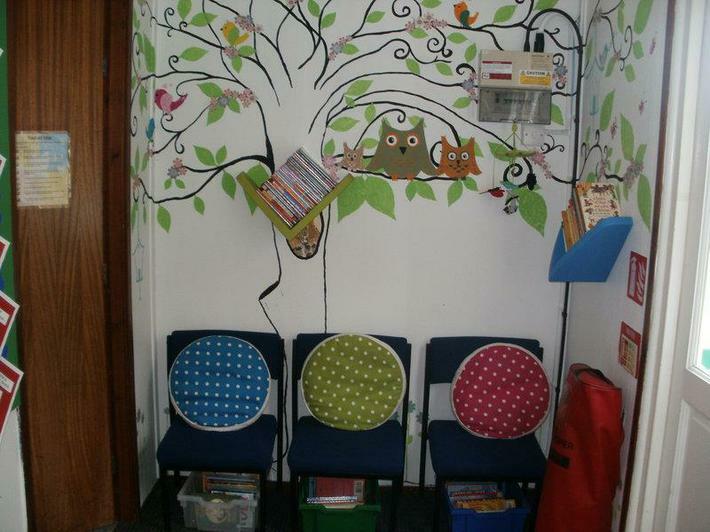 Check out our new reading tree area in the entrance to Year 4. It will be a lovely place to sit and take a bit of time out with a good book. We enjoyed our first numeracy lesson on place value. We have a great pirate ship display to help us out. This term our topic is Saint Mary's Church. As part of this we will be investigating structures and arches. Please could you save any carboard inner tubes from wrapping paper or kitchen roll to help us with our project. We will also be visiting the church on several afternoons. If you are able to come and help us please speak to Miss Swaine.